It's hard to believe it was only 7 short years ago that 7 Media Group saw life. We started with a simple idea to offer a very underserved segment of the advertising and marketing world a better understanding and execution for mobile strategies. Once we jumped into the mobile space we soon found boundless opportunities in so many facets of the mobile industry. From location-based mobile to consulting on social media to SMS campaigns to assisting clients with adding mobile to traditional media advertising we've worked on an incredible amount of very compelling mobile efforts. And we've seen our share of less than stellar services come and go over the years as well. The fact we've survived and even thrived in a constantly evolving mobile world we've found a niche by providing the very best in mobile technology and services. More importantly we feel we are the very best partner to small to large businesses. In such a brief period of time 7 Media Group has assisted countless businesses across all industries representing more than a half million of their customers receiving mobile messages. Handling and supporting the exchange of over 27 million text alerts doesn't happen by accident. The volume and reach of our services is but a very small part of what we've done these past 7 years. We've made business partnerships for long-term success through our support, customer service and industry knowledge. Representing national brands, local small businesses, universities, nonprofits and many more we continue to diversify our services to a broad base of customers and ultimately the consumer at large. Our success has given us the opportunity to share our mobile message across the world and throughout the United States with many professional speaking events in places like Munich, London, Frankfurt, Dublin and Mexico. Working with clients in over 40 U.S. states as well as consulting in Europe has given us an amazing view on mobile. This diverse view of the global mobile perspective allows us to bring the most compelling solutions for our partners across the board. Our growth has been managed and very methodical. With partner businesses and offices in Oklahoma, North Carolina and additional staff working in Chicago, New York and Europe we still maintain a small business atmosphere with a very personal touch. 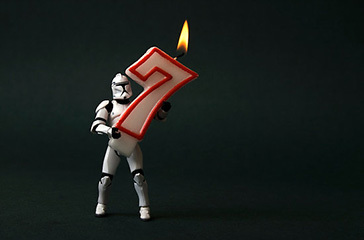 7 years is a very small blip on the small screen in the grand scheme of things but it doesn't go unnoticed to us the average American small business lasts about 5 years and only 1/3 make it to 10 years. We've stayed strong and grown because of our reputation for delivering success. We don't advise clients to chase the latest mobile fad. We bring them real solutions with real results and they appreciate us for this. And we appreciate them for allowing us to be a part of their success. And we very much look forward to the next 7 years and beyond! We thought we'd close with something fun. To illustrate how the mobile world has changed over the past 7 years we thought we'd look back and share the top 5 mobile phones of 2009! Did you own one of these?